What do you call a gathering of insect scientists? A cloud? A colony? A plague? The largest ever swarm of entomologists is flying in to Orlando, Florida this week. While more popular activities in Orlando include riding roller coasters and taking selfies with a famous mouse, the swarm will be buzzing on the topic entomology without borders. Among talks on biodiversity, conservation, insect evolution, and even entomophagy (eating insects), our own Bry the Fly Guy (aka Dr Bryan Lessard) will talk about his favourite topic: soldier flies. “You may have seen these flies, or more specifically their juicy maggots, powering the compost bin in your back yard,” says Bry the Fly Guy. 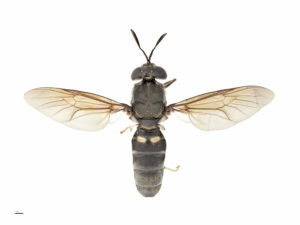 One of the first soldier fly species described was Hermetia illucens, named in 1758 by Carl Linnaeus, the founder of modern taxonomy. There are around 2500 species worldwide and more than 130 occur in Australia, some native and some introduced. Interest in soldier flies for turning organic waste into animal feed is gaining but these little critters are not always on our side. “Many people think of invasive species as pests that have entered Australia, but unfortunately our biodiversity is sometimes a source of pests. Some of our native soldier flies have found new homes in the North American continent and are munching their way through sugar cane and grass fields,” says Bry the Fly Guy. Of the 130 or so soldier fly species in Australia, around 50 are new to science. Bry the Fly Guy has collected soldier flies from Cape York to Kangaroo Island and works with them at CSIRO’s Australian National Insect Collection in Canberra. “I’m in the process of describing and naming the new species and designating their holotypes,” he says. When scientists describe a new species, they link the scientific name to a holotype, which is a single preserved specimen held by a natural history collection somewhere in the world. Bry the Fly Guy is also looking at the DNA of Australia’s soldier flies to understand their genetic relationships. “This week I will be revealing the first ever phylogenetic tree of the Australian soldier flies. A phylogenetic tree looks a bit like your own family tree, but instead of mapping out your relatives, it shows the evolutionary relationships between different species,” he says. The International Congress of Entomology runs from 25 to 30 of September 2016. For real-time updates follow @BrytheFlyGuy or the hashtag #ICE2016 on Twitter.